Assassin's Creed IV: Black Flag has proven to be the stand out title on PS4 with countless hours of gameplay available just through the main story and various side missions but there's even more to come. In just 2 days time, we Aussies and our NZ brethren will be able to download the Freedom Cry DLC which tells the story of Edward Kenway's former first mate, Adewale. One of the coolest things about this DLC is the character himself. Throughout the main campaign Adewale proved himself to be extremely interesting and hinted at a much grander story to tell. As an added bonus, Freedom Cry promises to be bloody, brutal and bad arse. Sydney, Australia — December 17, 2013 — Get ready to set sail, as Ubisoft® has announced that Freedom Cry, an all-new single-player downloadable content for Assassin’s Creed® IV Black Flag™, will be available for download in Australia and New Zealand by December 19th on PlayStation®4 computer entertainment system, and PlayStation®3 computer entertainment system, and today, December 17th for download on Xbox One, the all-in-one games and entertainment system from Microsoft, Xbox 360 games and entertainment system from Microsoft and Windows PC, and is included in the Season Pass. 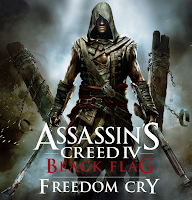 Freedom Cry extends the award-winning Black Flag experience with a new nine mission self-contained story featuring Edward Kenway’s first mate, Adewale, who is forced to face his past and sets out to free slaves. Once a pirate, now a trained Assassin and illustrious member of the brotherhood, Freedom Cry tells the story of Adewale 15 years after the end of Black Flag. Taking place in 18th century Haiti, Adewale will take his new crew and new set of weapons, including a machete and a blunderbuss, to assassinate enemies and free slaves, delivering merciless justice in plantations. When the fight goes to the seas, Adewale will command the Experto Crede, a fearsome brig that can take down the slavers in the Caribbean. For players interested in the Assassin’s Creed IV Black Flag Season Pass, it’s available now and includes Freedom Cry, as well as the exclusive Kraken Ship Pack, additional single-player missions, weapons, skins, and collectibles, including the Blackbeard’s Wrath add-on content as well as upcoming new characters for an expansive multiplayer experience. For more information on Assassin’s Creed IV Black Flag, please visit AssassinsCreed.com and The Assassins Creed Facebook Page.